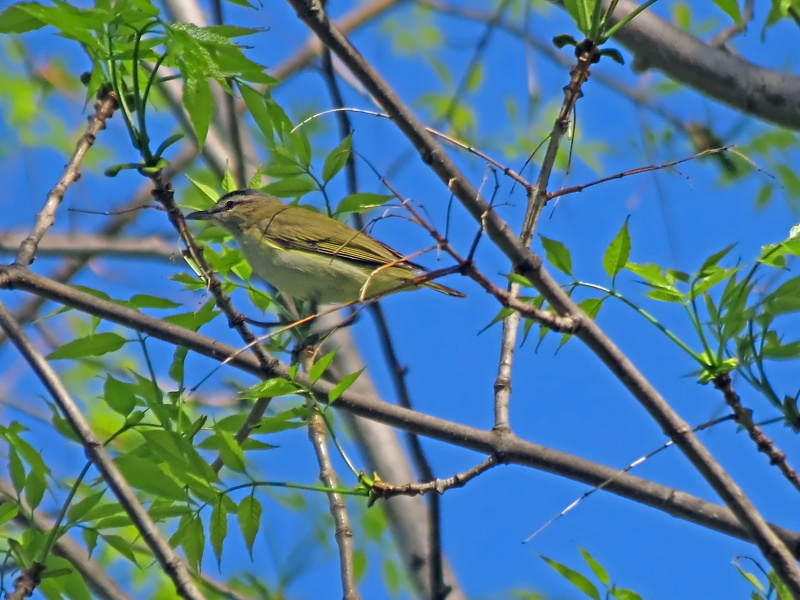 This Red- Eyed Vireo was photographed behind my house in Muskego, Wisconsin. The Red-Eyed Vireo is a small olive- or gray- backed bird, much like wood warblers but rounder head, with unbarred wings and with a strong black-bordered white eyebrow stripe. The bill has a more curved ridge and a slight hook. The red eye may not be obvious. It has a range from Canada to the Gulf States. It has a range of woodlands, shade trees, and groves. It feeds on mostly insects and berries. During summer it is usually around, but it is not most often seen, as it tends to stay out of sight in the leafy treetops.